Los Angeles, CA - Already known as the first transgender contestant in the Ms. Senior California Pageant and a consultant to Jenji Kohan in the development of Laverne Cox’s character on Netflix’s Hit drama series “Orange is the New Black”, Michaela Mendelsohn is now adding another new groundbreaking title to her resume. She has just been named the first transgender board member of the Trevor Project. As a Board Member of The Trevor Project Michaela provides strategic direction and ensures the organization has the resources to fulfil its mission. She uses her expertise in public speaking, advocacy, business development and LGBT issues to serve as an Ambassador for the organization. Michaela is focused on outreach to youth, speaking on issues specific to the transgender community and informing the community about the work of The Trevor Project. She serves on three standing committees: Finance, Programing and Board Development. She will also be an important part of it's Southern Initiative to study how best to introduce Trevor in the South where the cultural and religious divide is widest. To better serve Trevor's mission she has enrolled in it's 40 hour crisis training starting February 2016. A transgender activist, public speaker and businesswoman with over 40 years of entrepreneurial leadership experience, Michaela is currently the CEO of Pollo West Corp, one of the largest franchisees for El Pollo Loco restaurant in the Western Region of the United States. She founded the California Transgender Workplace Program to promote trans-friendly job conditions. 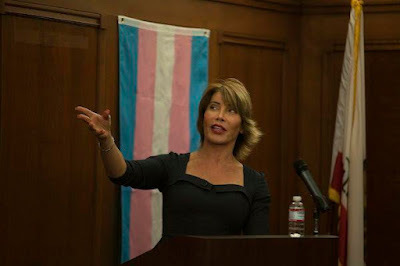 She passionately advocates for working transwomen through her efforts with various California trade associations. Her personal mission is to help transwomen find employment, social acceptance and a path to raise families of their own. As a writer and public speaker, Michaela speaks all over California on LGBT issues ranging from bullying to homophobia and transphobia. She was the Keynote Speaker at the Transgender Employment Empowerment Conference. She has spoken to over 100 groups including Museum of Tolerance, UCLA, Keck USC Medical Center, Pepperdine and Santa Monica College. Her autobiographical play, “Making Michaela” was produced by Los Angeles's Celebration Theater as a staged reading and will be 'work shopped' for a full production in 2017. Michaela was born in New York City, and moved to Southern California as a child, where she has lived since. She was married for over 30 years and is the proud parent of three, grown children. In 2008, she legally changed her name to Michaela Irvi Mendelsohn and her gender to female. She now lives with her partner, Carmel and their two-year old son. She is honored and proud to be the first transwoman on the board of the Trevor Project and looks forward to contributing in every way she can, supporting the LGBT community in California and around the country. Michaela works tirelessly to make a difference in the community and the world around her.